To say that we have been busy would be the understatement of the year. It has been one thing after another - a mix of necessary evils, responsible evils, and fun trips. 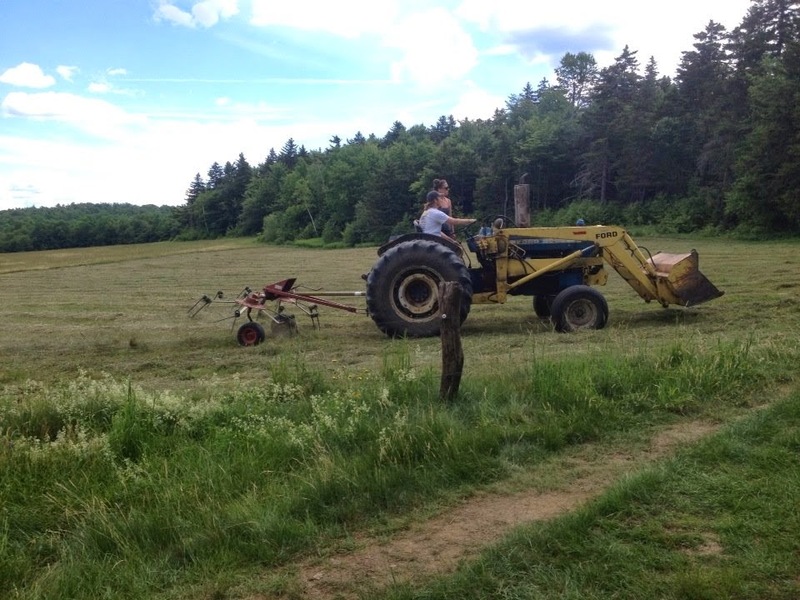 Included in the list of things I had never done before was driving a tractor, haying, legit whitewater kayaking, and catching smallies in Massachusetts. I have caught plenty of smallies in plenty of places, but had yet to wet a line in smallie waters here in the Bay State. Sunday, I decided it was time to remedy that. I wanted to fish the lower stretch of the Deerfield River near its confluence with the Connecticut River. The stretch is a popular stretch for float tubers and rec kayakers and I'm sure sees plenty of fishermen too. But kayak fishing isn't terribly popular here yet, so I also suspected that we could put together a 4-5 mile float and do quite well. However, both the Deerfield and CT are heavily influenced by hydroelectric dams. For kayak anglers, this means that the water needs to be in the "sweet spot". If the level is too low, you are going to be doing a ton of dragging. If too high, you aren't going to be able to slow down long enough to fish. If just right, you lucked out, but you need to be very wary of the release schedule because your window of opportunity may be short. I pulled up info for the lowest dam on the Deerfield and it was releasing with the gauge below it reading around 1000 CFS. It was expected to drop as the day went on, but still, fishing a small river at that flow can be tough. So I decided to head over to the CT and scout a few sections of water there. If nothing else, I knew there were a couple spots big eddies I found on the map that should produce even if the water was running. We got to the first spot I wanted to check and found a small, public access. It was about 50 yards from the pull-off to the water and as we made our way down a path to the river, it was evident that the water was not running and the area looked extremely fishy. However, it also had obvious signs of being a public area - lots of footprints, fishing lines, worm containers, and other traces of humans. Still, we figured we could paddle up or down river to get away from that, so we loaded the yaks and launched. I gave Mary May a 3" Berkely Powerbait Grub to start - probably my favorite all time smallie catching bait. I was switching between a crankbait, tube, and finesse worm. We were fishing all the right places - shoals, isolated rocks, current seams, deep eddy pools, and pipe discharges, but we couldn't buy a bite. Eventually, I had a fish chase and swipe at my crankbait, but I am fairly sure it was a shad that was still hanging around after the big spawning run occurred in the weeks/months prior. Finally, I threw the finesse worm along a deep bank, let it sink, and BAM - I had a bite. It isn't hard to tell when you hook a smallie. They are probably the hardest drag peelers of any of the black bass species. Although my first MA smallie wasn't a giant, he fought hard. It turns out he was hanging out around a submerged log and couldn't resist the fall of my worm. As we continued on, I tried a few different lures and picked up a couple more short fish on the finesse worm and crankbait. The wind was gusting fairly hard at times, making it difficult to see submerged targets. Thankfully, it stopped long enough for me to stand and spot a ledge that dropped from about 6 to 15+ feet. I made a long cast down the ledge with a Power Team Lures Food Chain Tube in the Susky Slayer color. There was no denying the strike - a solid thud and immediate run to deep water. The fish was pulling me toward him and swimming circles around the boat. Every time I tried to sit he made another drag peeling spurt. Mary May noted the awkward smile on my face, asking whether it was caused by the joy of hooking the fish or nervousness of landing him. "Both", I exclaimed, with an even bigger smile. Eventually I managed to make my way to the seat, but the fight continued. The 7' Carolina Custom Rods Jig and Worm spinning rod was doubled over and taking the brunt of the battle. Finally, I managed to wrangle her to the boat and scoop her into my lap. I wiggled my thumb into her mouth and lipped her with a sigh of relief. The FCT jighead was stuck squarely in her upper lip. The fish was a thick, 3+ lb smallmouth, in the 18" range. We snapped a few photos and sent her on her way. Tubes - they always seem to get it done! My day was made, but we fished a while longer. I shook off a couple short fish before hearing a loud announcement over a PA system. We coulnd't make out any of the words, but immediately I wondered if it was time to release. Usually you get about 30 minutes between the time the horn sounds and the time the water is physcially released - per federal law. Then about 10 minutes later we heard it again, then again. We decided to turn back down river and fish toward the launch. We heard one last announcement then nothing. After another 10 minutes or so, I looked down river and noticed that what had previously been an exposed shoal was quickly going underwater. Likewise, a small chute was turning into a true rapid. It was time to head back to the launch, which thankfully wasn't far and the Malibu Stealths handled the flow with no problems. By the time we got back, the water had risen about 2 feet. It came up another 8"-10" by the time we stowed the gear and started hauling the boats back to the Escape. It was actually very interesting to watch as the river transformed into something totally different from what we had found when we arrived. After unloading the gear and loading the yaks onto the car we decided to go back and take another look. Now the water was about 5 feet above where it had been when we started. You could see almost no shoals and the flow had at least doubled. We were glad we called it quits when we did. Although I know we could have easily maneuvered back to the launch, even in the high, fast water, you can never be too careful. It is another reason to always wear your PFD, be aware of river levels and release schedules, be attentive for sirens/horns when fishing below dams, and fish with a partner when possible - especially on new water. The 3 hour trip was just what the doctor ordered - some solid smallie action and one awesome kicker. During the BASS Slam a few years ago, I caught every species of black bass in the US. The Suwannee bass, pound for pound, is pretty darn strong, the Shoal bass will seriously bend a rod, and AL Spots are absolute brutes. But I think the smallmouth might be my favorite fighter of them all. The mix of drag peeling brute strength, aerial acrobatics, and clever runs are nearly impossible to beat. I'm more than ready to do it again! Until next time, tight lines! I often get asked where I catch the fish I blog about, or with what baits, or what techniques. And I always share the baits and techniques. I'm not doing anything special. But there aren't many people I share my fishing spots with. I'm a firm believer in learning by scouting and exploring. 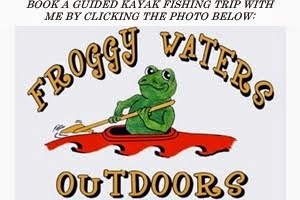 Laziness is not a trait befitting of my style of kayak fishing. As any true river rat would oblige - you have to earn it. Rarely do I come home from a day on the water without a few bumps, bruises, and scrapes, some missing plastic on my yak, maybe a little poison, and usually a raw thumb. And the next morning I can count on needing to stretch the soreness from my body before I start my day. So my answer to where I fish is typically, "off the beaten path, as far as I can get." I suspect that the KBF Open, which took place in March on Santee Cooper, will be the only time all year that I use an actual boat launch. So what is my point? Well, a couple weekends ago, Bill and I hit the water for our last hurrah. Based on our schedules, we knew it would be our last kayak fishing trip before I moved north. For a while, we debated which "old favorite" we would hit. However, as we talked, we both kept getting more excited about a stretch of water I had scouted on satellite imagery over the winter. It had everything you could ask for, but access looked nearly impossible. Our curiousity of the unknown was too great - we opted for the new river. And the nearly impossible access lived up to the hype. We did a lot of dragging, portaging, and trailblazing. Multiple times I found myself questioning whether it was worth it. But getting off the beaten path has rarely let us down. That day was no different. We arrived at the river around 7:30 AM. The spot we wanted to launch from was posted as private property, no trespassing. Option 2 - more of the same. Option 3 was about 100 yards of nearly vertical boulders that would have probably put us both in casts. But Option 4, although it was much further down river, was finally doable. We loaded up, drug about 100 yards down to the water, and started our upstream paddle. It didn't take long before I hooked up with a small largemouth on a balsa crank in a bluegill color. And soon after we came to a gorgeous shoal where we caught about dozen largemouths up to 2.5 lbs on Premier League Lure spinnerbaits. Then came the jam - a massive mess of an obstacle that would require a portage. The only possible portage was cringeworthy, to say the least. It was 100 yards of mixed boulders, brush, and branches - the first half of which was uphill. Thankfully, we made it through without any major damage, other than some scrapes and, as we would find out the next day, poison oak. Then we dropped back into the river down a steep, 4-foot clay bank and were on our merry way, mumbling, "what the *bleep* are we thinking" under our breathe. But only a few casts later, all was forgotten. A 17" largemouth smoked a BBB Fighting Frog and we were back in business. The river was littered with wood cover and overhanging bushes and vines. We flipped and flipped and flipped with mixed results. There was so much wood, and deep wood at that, that it was hard to pick it all apart properly. But we were catching some fish, and also knew that a lot of fish were bedding and wouldn't eat unless we put our baits right in their face. Granted, neither of us care much for catching bedders, and in the stained river, it would have been nearly impossible anyway. Eventually, I picked up my spinning rod and began skipping a finesse worm way back under overhanging brush. It didn't long before I saw my line swim sideways, set the hook, and heard the drag peel. The fish fought like it was a giant, putting up one of the best fights I have had all year. When I finally got him next to the boat, I was shocked to see that the brute was 'only' 4 lbs. We snapped a few photos and let her go. We continued fishing up-river. Our goal was to get to a large shoal I had seen on the map, which had 2 or 3 very large eddies behind it. We were catching solid fish with regularity - 2 and 3 lbers that all fought like freight trains. We have tangled with some mean bass, but these might have been the meanest largemouths I have ever fought. In fact, at one point during a fight, Bill exclaimed, "are there smallies in here?". Finally we got to the shoal and immediately started hooking up. I caught a couple on a rocky bank using a squarebill crankbait and Bill caught a few on a tube. We worked our way around the eddies and rock ledges, picking off fish fairly regularly. I had a big catfish hooked, momentarily, but never got a good hookset. After catching about 20 bass at the shoal, we were beginning to think that no bigger fish existed. Then I got a bite that started pulling my boat around. Based on the fight, in any other river, it would have been well over 5 lbs. In this river, it was a 3.5 lber....my heart sank a little. Then Bill set the hook on a giant - a legit giant - flipping a tube along a deep portion of the shoal. The fish came to the surface, spit the hook, and returned to the depths. It was easily a 5.5-6 lb bass. Another heartbreaker. At that point, it was time to turn around and head back down river. We weren't getting a ton of bites on the way back, but the bites we were getting were nearly all 3-4 lb fish. The baits of the day were the Fighting Frog, Texas-rigged with a 4/0 hook and 3/8 oz weight, and finesse worm, fished weightless and wacky. We caught a couple gorgeous fish right above the huge jam and then began mentally preparing for the portage. At this point, we were fairly exhausted and pondering if we could just smash through it. We couldn't. But the portage went faster than before and gave us about 30 minutes to fish downstream from the launch. The river was narrow and shallower in that stretch and the fish were spooky. We spotted a few fish beginning to set-up on beds and other cruising the bank. We only caught a couple, but we did see one bass that was around 5 lbs and a few more that were good size. Maybe next time "we" will fish down-river instead. The day kind of culminized Bill and I's kayak fishing trips over the years. We've learned a ton from each other and became much better fishermen because of it. He started as a bass boat convert, and since, we've fished together in 7+ states, battled flows over 6000 CFS, run class III rapids, completed the B.A.S.S. Slam, won the RiverBassin Team of the Year Title, and caught plenty of big bass in places others completely overlook because we put in the extra effort and go the extra mile. Everyone defines an adventure differently, but as a kayak angler, the possibilities are endless for you to create your own adventures - and memories that last a lifetime. We certainly walked away from the trip smiling. We had taken on a new river and it proved to be one heck of a physical challenge. We also caught about 60 of the meanest largemouths we had ever hooked. Our best 5 went around 20 lbs and felt more like 40. When that river turns on again after the spawn, it is going to be insanely good. And on top of it all, we had 4 deer swim right in front of us, and saw a bald eagle, turkey, and multiple osprey and herons. It was yet another great adventure with a great friend!